If you want to raise money for your business venture, you generally have a few traditional options. You can (a) ask your family to back your venture, (b) apply for bank financing, or (c) seek investors to participate in your business. Since 2009, bank financing has pretty much dried up. Banks are holding more and more reserves, and taking very little risk. As one of my clients that was trying to develop real estate said, “If I had a million in the bank, the bank would loan me a million.” Banks really don’t want to touch risky ventures like real estate and development of new unproven products and services. If the bank and your rich uncle will not fund your venture, can you ask others to invest in your company? In the U.S., the answer is yes, with qualifications. The Securities and Exchange Commission heavily regulates the transfer of securities in the United States, which makes it difficult for small businesses to raise capital while trying to comply with the SEC rules and regulations. There are exemptions to registering your company’s sale of investments with the SEC, but lawyer costs for drafting the documents necessary to protect yourself can get expensive. Crowdfunding websites — such as Kickstarter — are another option. These websites allow individuals that like your idea to contribute the money you need to start a project or expand it. The difficulty for these types of websites and for the person trying to raise capital is that the “investors” are really donating or purchasing the opportunity to support a project and may get goods or other benefits for doing so. However, they cannot receive any equity in the company itself. Therefore, it is difficult to raise a significant amount of capital for your venture unless you can get hundreds or thousands of people to contribute to your venture depending on how much money you need. Any significant investor would typically want to participate in the growth of your company, and current U.S. laws do not allow individuals to do so without complying with the strict securities exemptions. 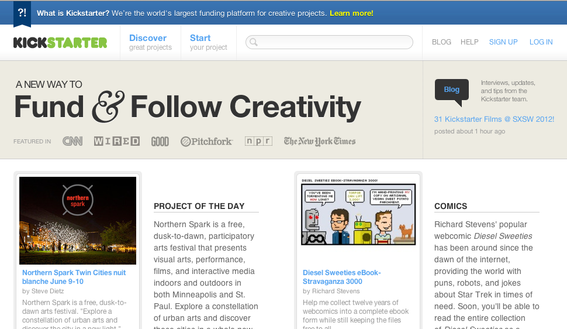 Kickstarter focuses on creative, artistic projects. Many legislators are concerned about this barrier to capital for small business and would like to make it easier to start a business in the U.S. There are at least three legislative proposals to allow exemptions for crowdfunding. One of the bills, H.R. 2930, has already passed in the House. Another bill — proposed in the Senate — is S. 1971, which takes a more strict approach to crowdfunding by requiring an intermediary to be involved in the transaction. The intermediary could be an Internet site that would pose as the platform of the purchase of these securities. The Obama Administration has been very supportive of the House bill titled the Entrepreneur Access to Capital Act, which allows companies to use crowdfunding to raise up to $1 million or up to $2 million if the investors are provided with audited financial statements. The investments for each individual investor would be capped at $10,000 or 10 percent of the investor’s annual income, whichever is less. Currently, the House bill is stuck in the Senate because of lobbying by several groups who argue that small investors need to be protected and should not be allowed to invest money in speculative ventures. This argument ignores the fact that anyone can spend his or her entire paycheck in a casino on one hand of blackjack. Hopefully, the Senate will see that small businesses need access to capital to help our economy grow and pass one of the bills offered soon. With the popularity of crowdfunding websites, the Internet has proven that people are ready to invest in ideas they like and the government should not stand in their way.